Day 15! 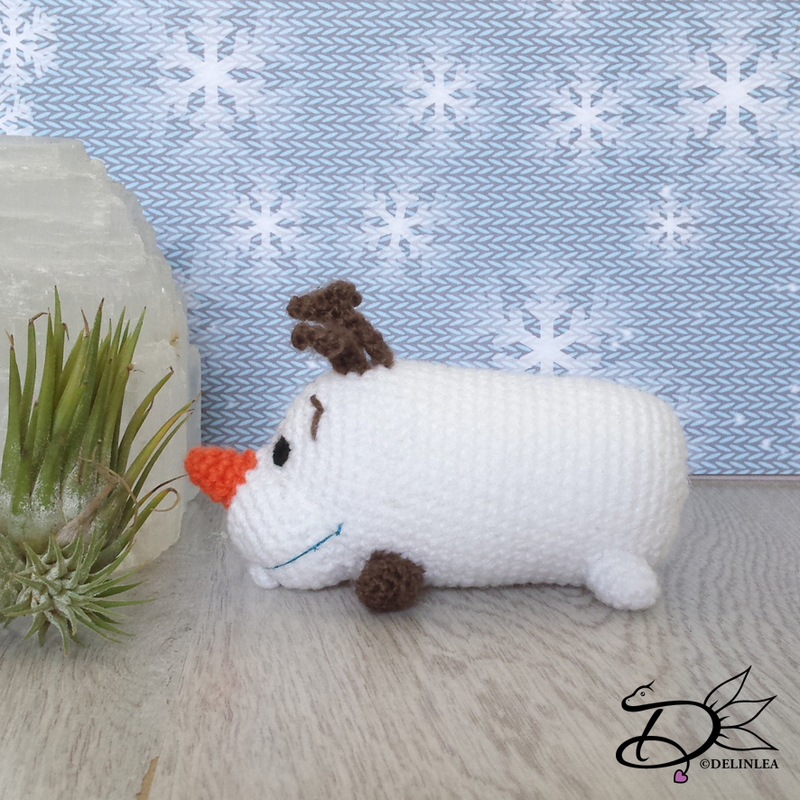 And it’s Olaf’s turn! I just had to include them! He’s to cute to be left out. Maybe there are many more tsum’s you would have liked to see in this countdown, but hé, we have only 25 days and there are way~~ more Tsum Tsum’s haha. ♥ Yarn: in the colors White, Orange and Brown. Make 2 in White and 2 in Brown. Version 1: Chain 9, insert in 2nd cgain from hook, 3SC, chain 3, insert in 2nd chain from hook, 7SC. Fasten off and leave long tail for sewing. Version 2: Chain 7, insert in 2nd chain from hook, 1SC, chain 3, insert in 2nd chain from hook, 7SC. Fasten off and leave long tail for sewing. Make 2 of version 1 and 1 of version 2. Attach the mouth just under the middle of the face. To create the illusion of a mouth, use some thin (blue) thread and place it over the middle, you can pull this pretty tight until you like the result. Now you know where the teeth go as well and sew them on. Sew his nose on top of his mouth, just right where it looks cute. Attach the hairs on top of his head. For the eyes you can either choose to use felt or you can embroider them on. I chose to embroider them on, cause yeah why choose the easy way haha. 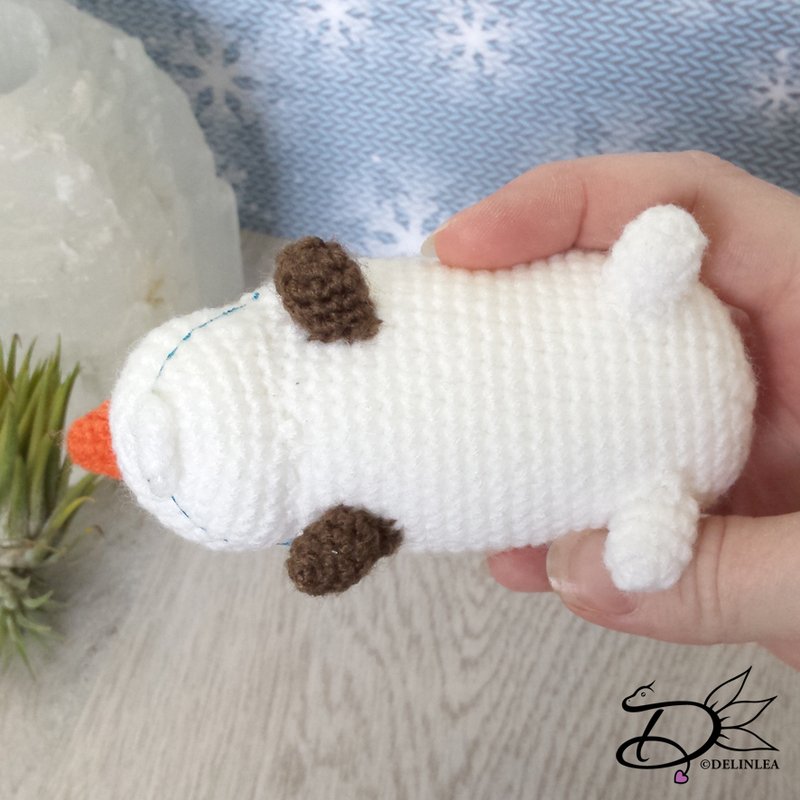 But which way you choose, Olaf will look cute. ♥ Gesso or White Piant. 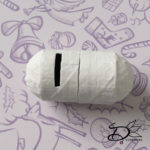 When you have done that, devide the roll in 2 even parts, this is the place where your moneybank will open and close. 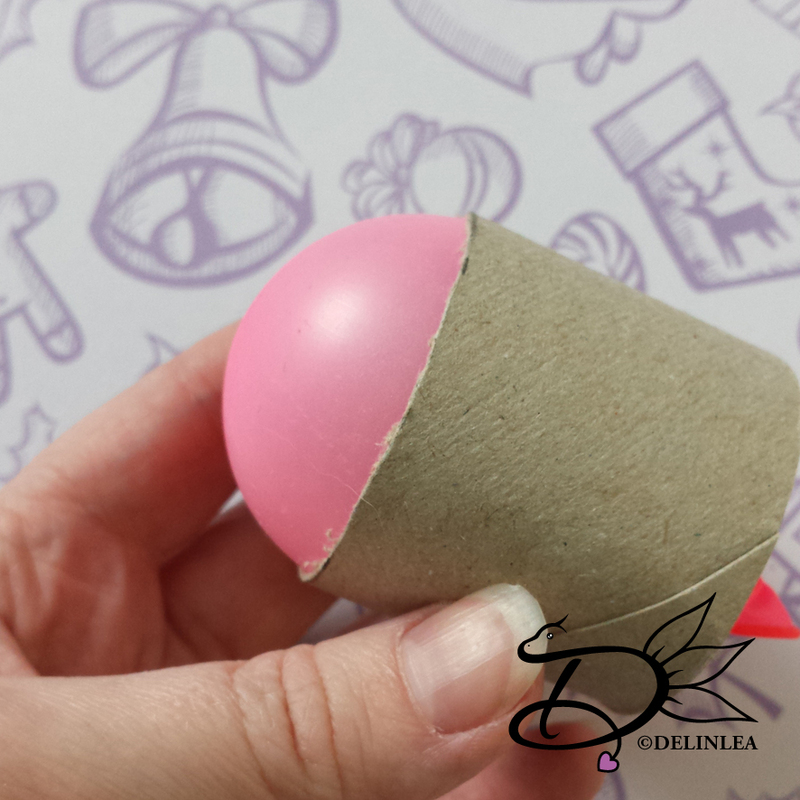 Take your waterballoons and blow them up, don’t make them too big cause they need to fit in the toilet roll tube, but make them big enough that it’s sticking out a bit on both sides. This way the balloon will stay in place without any tape. 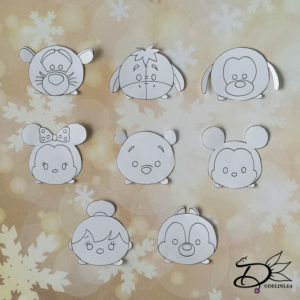 One of these sides, the one without the knot, will be the rounded shape of your tsum tsum. 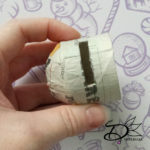 Now on to the paper maché part, get the glue ready and make small strokes of the newspaper. Glue the strokes on to both parts of the body. Don’t cover the part where the balloon has the knot. That’s the part where the body connects again to make a full tsum tsum. 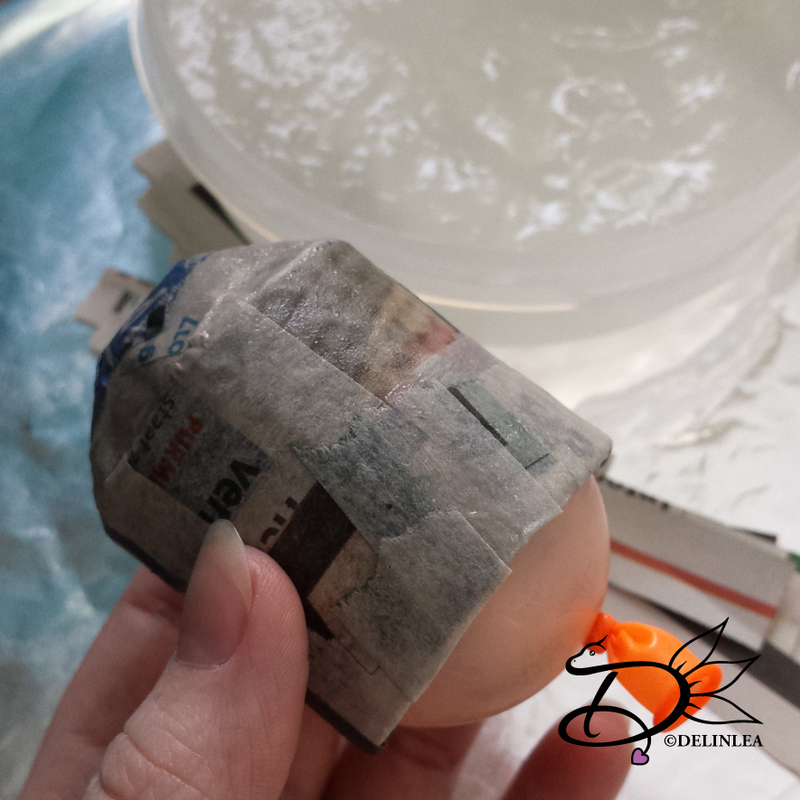 Make about 4/5 layers so it’s strong enough when you remove the balloons after drying. When you are ready let the parts dry over night. Remove the balloons when the are completly dry! Now it’s time to make the opening to put the coins in. I took one part of the body and measured it about 1cm from the edge, then made it about 0,5cm wide and 3cm in length. You can make it bigger or smaller, depending on the coins in your country. Use an X-acto knive to carefully cut the opening. 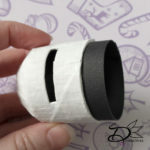 When you have done that, paint the inside black and the outside white with gesso or acrylic paint. Make from black cardboard a stroke of 1,5cm by 14cm and draw a line in length at 0,5cm from the edge. 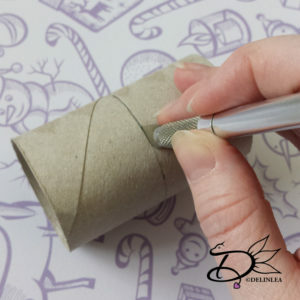 Glue this in the the part of the body where you made the opening for the coins in. Glue only the 0,5cm part in length. Now you can put the body together. Make 4 balls out of clay for the legs. And make all other body parts of clay if needed, depends on which tsum tsum you chose. 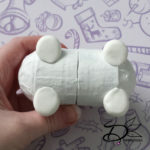 Glue the clay parts to the body and let them dry. 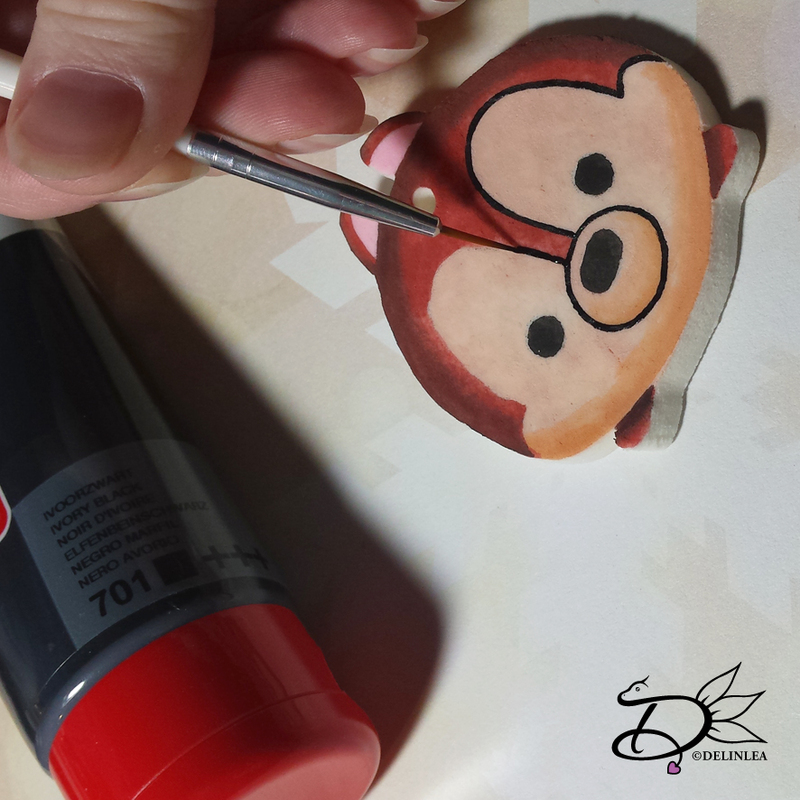 Now on to the last part of making the tsum tsum money bank! Let’s paint! 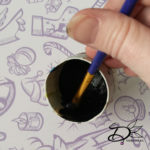 Use acrylic paint in the colors you need. If you find it hard to paint the design straight on, draw it on with a pencil first. This way it gets less frustrating. If you want you can also varnish the whole thing when you are done painting. This will protect your tsum. And I guess we are ready! 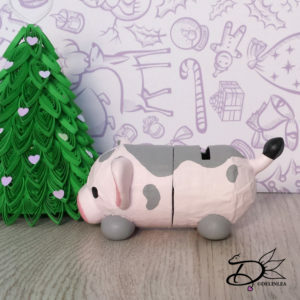 I hope your Tsum Tsum money bank turned out cute! Let’s hope they safe a lot money for us haha (will they be magical?!) Don’t forget to show yours with the #DelinleaDIY I would love to see yours. It’s day 13 and that means we are half way through the Countdown! And this day we will make Goofy Tsum Tsum with his cute little hat! ♥ Yarn: in the colors White, Black, Beige, Red and Green. ♥ Cloud Yarn in white (optional). In Beige, you won’t work in continues rounds. Make 2 in Black and 2 in White. Fasten off and leave long tail for sewing. Stuff the ears lightly. Fasten of and leave long tail for sewing, stuff his hat slightly. His snout you will sew on covering the lower part of the white, which you used for the face. this way you create the shape of the eyes. For the eyes and nose you can either choose to use felt or you can embroider them on. I chose to embroider them on, cause yeah why choose the easy way haha. But which way you choose, Goofy will look cute. It’s still snowing outside! OMG I just wanna be outside haha. Snow is just the best thing in the world. 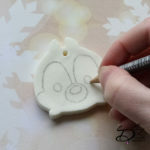 Anyway I made you a Tsum Tsum clay ornament tutorial with a homemade clay recipe, with just 2 ingredients. 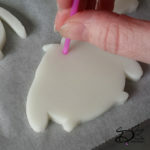 I love how quick you can make this clay and you can either choose to let it air dry or bake it in the oven. Let’s dive into the tutorial! ♥ 1 Cup Baking Soda. ♥ Bakers twine or any other thread. 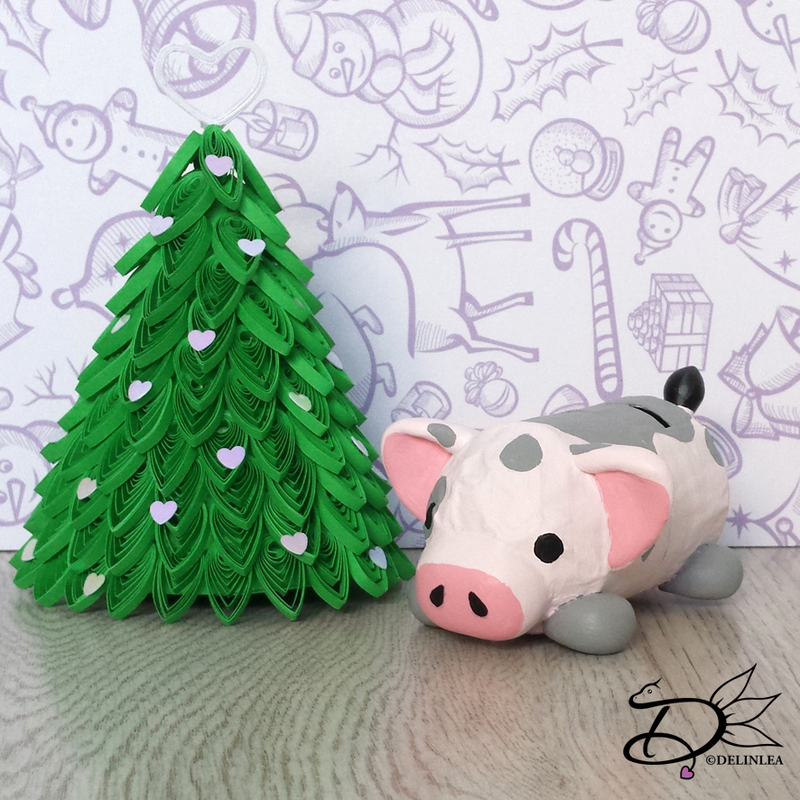 Let’s start making the ornaments! 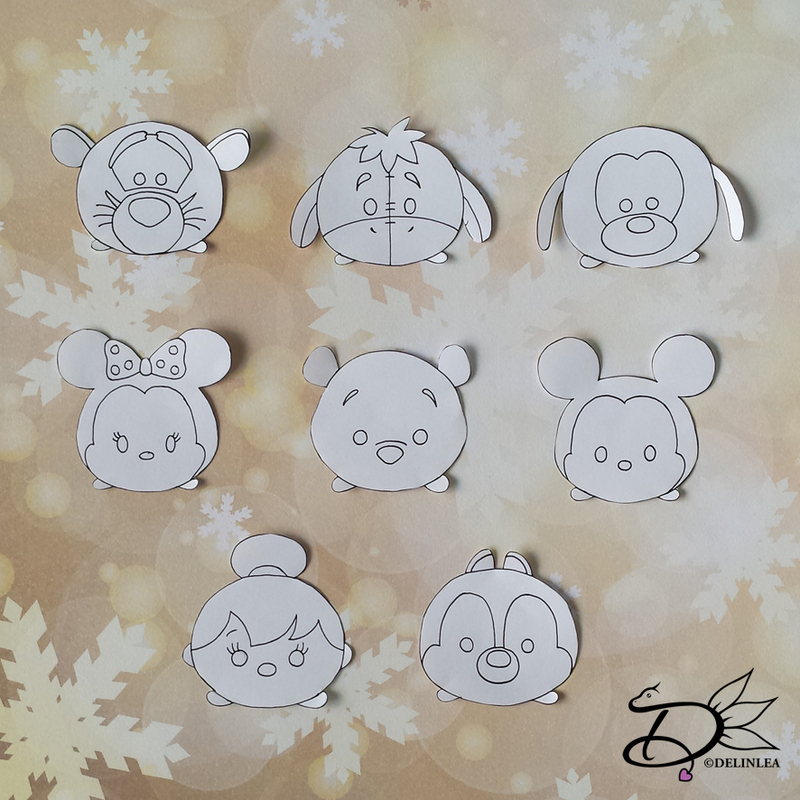 Draw out some line art Tsum Tsum’s on paper, you can use google for some reference, that’s what I did. When you are happy with how they look, cut them out, and put them aside for now. (you can also print out some line arts from google if you feel to lazy to draw them xD). Next, roll out the clay on a flat survice with a rolling pin, until it’s about 0,5 cm thick. Don’t roll it out to thin, otherwise the ornaments won’t dry flat. 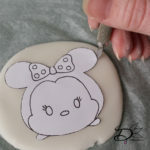 Put the paper Tsum Tsum you just drew on top of it and go along the edges with a x-acto knive. Make as many as you want and put them on a baking tray with some parchment paper. Make some holes with a straw for hanging. 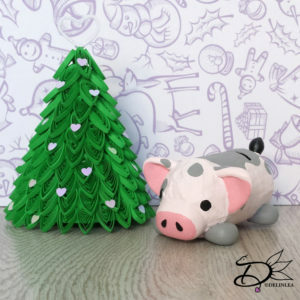 Now you can either choose to let the ornaments air dry in a warm place for at least 24 hours. 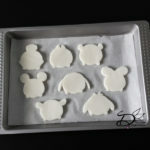 Or you can choose to bake them in the oven, what I did. If so, place them in the middle of the oven and bake them on 80°C for about an hour. When they are 30 min in, make sure to flip them over. And when ready let them completly cool down. They can still be a bit wet, but that will dry over time, don’t worry. 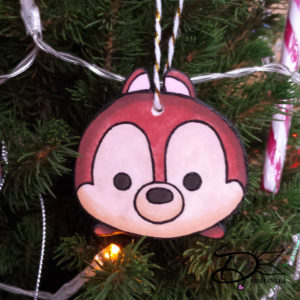 Now take your dry, white clay ornaments and draw on your Tsum Tsum face with a pencil. (You can use those drawings you made in the beginning, as reference.) 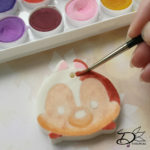 Now you are ready to start coloring them, it’s very easy to use watercolors for this, but don’t use too much water. Well, you will know what’s too much and too little haha. Just have fun and make them as fancy as you want. I just realized you can also put some glitters on there, specially for Christmas! To make them more neath, take a thin brush or liner brush to make lines with black Acrylic. you can also cover the sides with black acrylics if you like. Now take about 15cm of bakers twine and put it through the little hole you made before letting them dry. And now hang them wherever you want! 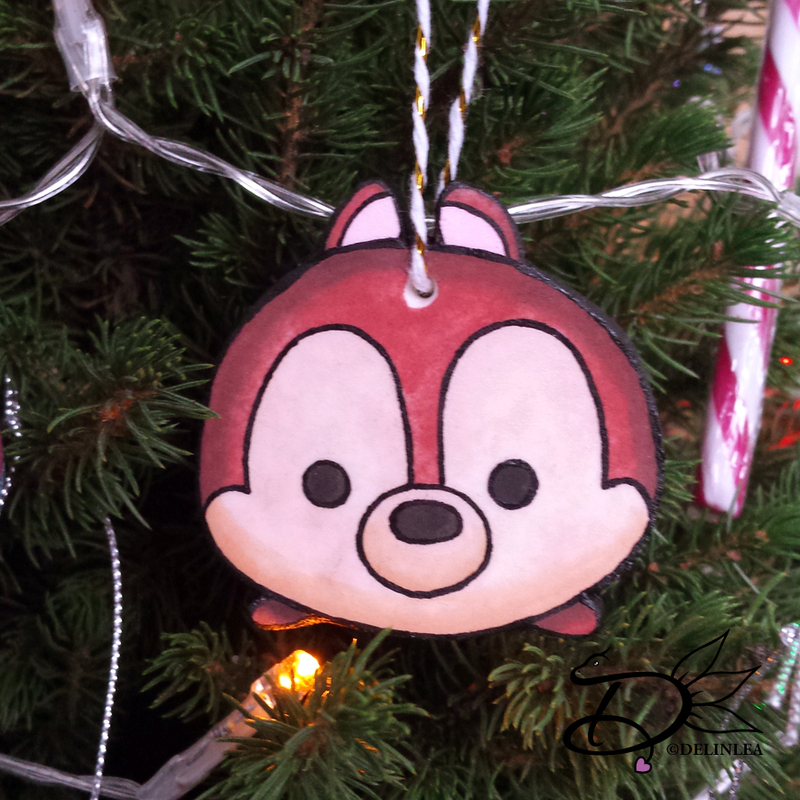 I love how mine turned out, they look so cute in the Christmas tree. I guess I will make some more after this countdown. Haha not much time to make more now xD. 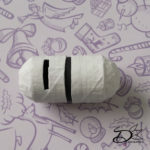 I hope you will like this tutorial, and that you will make many! 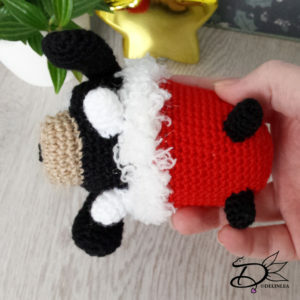 How cute would they be as a gift for someone! Have a nice day lovelies, and don’t forget to share them with #DelinleaDIY. While writing this blog, it’s snowing outside! It’s so pretty! I wanna go out! haha, so, I’m a little bit distacted. Snow is the thing I look forward to all year, the white world that becomes so quiet is just so wonderful. I can enjoy it every minute. And when you have been outside for hours, walking and making pictures, coming inside and make hot Chocolate. to enjoy the snow falling from inside. And when I’m warm again I go out again until I’m so tired I can’t stand on my legs anymore haha. Okay back to my countdown, it’s day 11 and Winnie the Pooh’s turn! one of my favorite shows to watch on television~! I have so many good memories of him! Do you have any special memories with Disney characters?! Anyway on to the DIY. 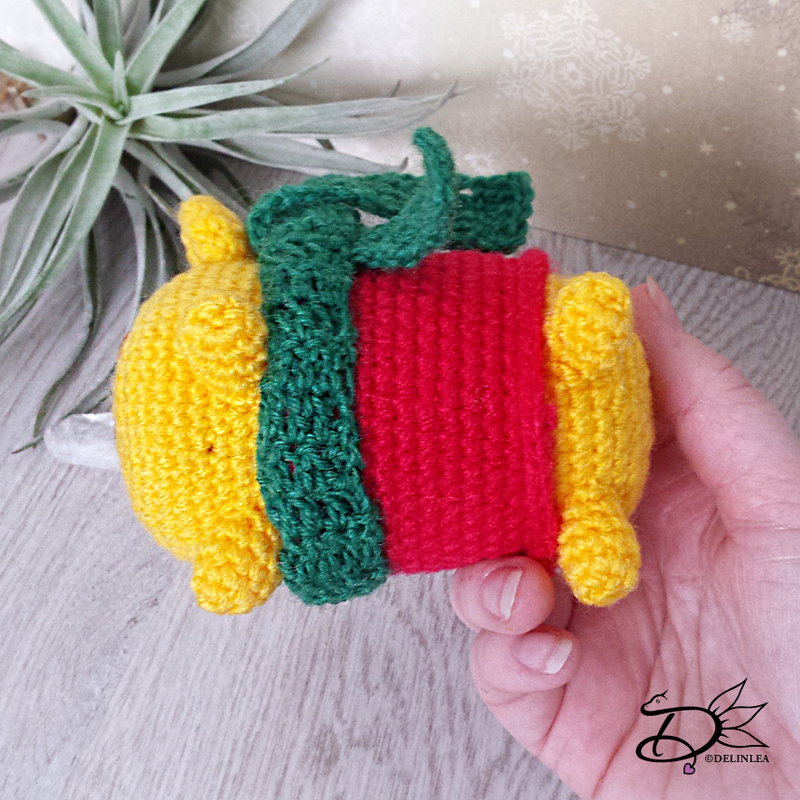 ♥ Yarn: in the colors Yellow, Red and Green. ♥ Embroidery needle with brown thread or brown felt. Flatten his ears and sew them on top of his head, slightly to the side. Tie his shawl around his neck, I left is loose but you can choose to sew it to the body. 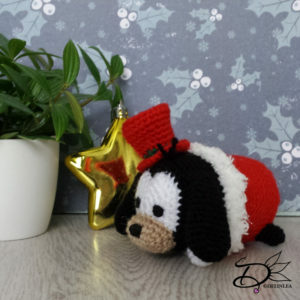 For the eyes, nose and other detaul you can either choose to use felt or you can embroider them on. I chose to embroider them on, cause yeah why choose the easy way haha. 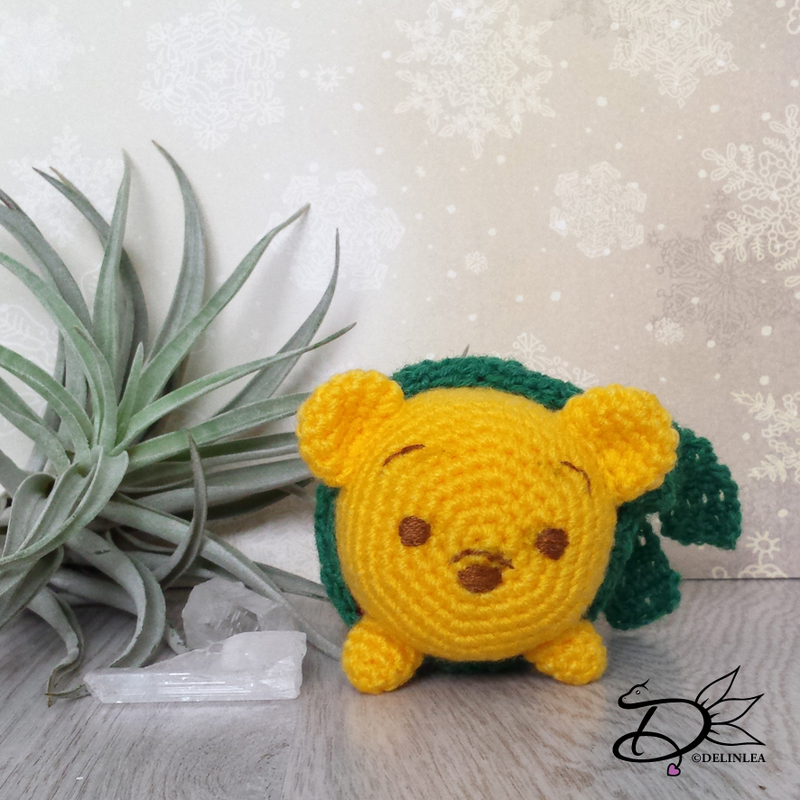 But which way you choose, Pooh will look cute. I hope your Pooh bear turned out cute as well. I will run, to go out again and enjoy the snow while it’s here haha. Enjoy the rest of your day!